State Representative Mary Czaja of Irma thinks a model developed by Three Lakes could help northern school districts facing critical budget problems. Three Lakes schools have opened a Fab Lab which is a public-private partnership as Czaja explains. It’s a type of 3-D computer-based manufacturing. 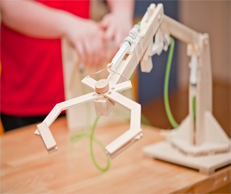 Czaja says the goal is to have a Fab Lab in every K-12 school in the 12th Senate District….